You couldn’t have asked for better weather in Santa Barbara on Saturday to kick off the college season on the West Coast. The teams seemed to feel it, too. Whether it was the weather, field conditions, or just level of talent, there was some great ultimate played in the women’s division throughout Day One. Check out the bracket and the four biggest storylines to come out of the tournament so far! The Santa Barbara Invite may feature eight teams in our top 25 rankings, but two quickly asserted themselves as the top of the pack. UCSD picked up right where they left off in 2018, confidently closing out games against teams using their discipline and sharp handler set. The Psychos may have shorted a few hucks early on, but they quickly straightened it out in time to wallop the three teams they played. They beat Wisconsin, UVic, and Cal by an average margin of seven. Wisconsin was the only team to really put up much of a fight, and even then they struggled to break against UCSD’s structured offense. By virtue of their offense, most of the goals and assists went through Kelli Iwamoto and Dena Elimelech, but that doesn’t paint the full picture. UCSD is a deep team and they still have room to grow out the strength of their full roster. Considering how prepared they look on the first day of their regular season, it’s not impossible that they’re just in a league of their own tomorrow. If there is a team that will challenge them, it’s UCSB. The Burning skirts are the Yin to UCSD’s Yang. While San Diego may be calm and disciplined, UCSB is fiery and aggressive with the disc. They are always looking to attack and leave the defense in their dust. No other team was more willing to throw their bodies around to cause a stop or pluck up the disc from an impending turn. Audrey Brown herself must have averaged at least five layouts per game in pursuit of the disc. The team is headlined by Julia Kwasnick, a walking mismatch who’s earned her own sideline cheer that her team is happy to chant with every block — “Julia says NOOO!! !” UCSB has gone without a loss all weekend despite playing an extra game against BYU on Friday night. They’ve set themselves up for success on Sunday and have all the momentum in the world behind them –mostly self-generated. When was the last time Stanford lost a pool play game at the Santa Barbara Invite? That’s not rhetorical; it’s a genuine question. Superfly’s dominance goes beyond ‘dynasty’ and has become closer to ‘sport-defining.’ All this only made their loss to Cal Poly SLO that much more surprising. The SLO Motion women had a fair amount of hype heading into the tournament, but it was assumed that they would still be fairly raw at their first tournament of 2019. And, to be fair, they were definitely shaky to start. In their first game, they lost badly to Chicago, a team that Stanford beat 13-3. So when SLO stormed out of half with five straight points to take a commanding 12-6 lead over Stanford, it seemed unfathomable. Cal Poly went on to take the game and make a statement win over Stanford. It was enough to take the pool and force Superfly to play their first SBI prequarters possibly ever? To add to the madness, Cal Poly almost lost a game to UCLA the game before their Stanford win. UCLA had their own tight game against last year’s SBI champs but couldn’t close out against Stanford’s experienced offense. In their game against Cal Poly, though, Malia Smith and Katherine Jordak were on a tear. Cal Poly never let the game get out of hand but UCLA looked in control for most of the match. It was only in the final few points, with the score tied at 11, that Cal Poly managed to pull away. They put out their best seven–which included freshmen, sophomores, juniors, and seniors–and stole the game right out from under BLU. Most of the late game heroics can be attributed to Sherita Li. She took over in the final three points to earn the win for Cal Poly. If they hadn’t managed to pull off the win, SLO would have likely missed out on bracket play, which is wild, considering that they are heading into Sunday as the winners of their pool. The Bella Donnas drew the short straw by being placed in the same pool as UCSD and playing them in the first game of the tournament. From the first point, it was clear that Wisconsin had talent, but UCSD never gave them the chance to get settled into a rhythm. Apart from facing the clear favorites on the first game of the day, they had another disadvantage — the team had only managed to practice on an indoor field once since December. The moment Wisconsin was give some time to settle, they really started to show signs of their true potential. After losing to UCSD, the Bella Donnas went to work against Cal and gritted out a tough win to start building some confidence. That win gave them the assurance they needed to start playing a bit looser and with more swagger. Their next two games, against UVic and UCSC, both ended with Wisconsin more than doubling the score of their opponents. Perhaps most impressively, it did not seem as if Wisconsin ever played a kill line. For the most part, the coaches staggered the playing time of Brittney Kokinos, Camila Flowerman, Sabrina Hoffman, and Margaret Walker, ensuring that their premier talents never overexerted themselves. Wisconsin is very aware of bid implications for the North Central, but it is clearly not dominating how they are playing. The team used day one to find their bearings and establish themselves as competitors at Santa Barbara. Tomorrow we might really get the chance to see what their ceiling may be. Washington has always been on the cusp of greatness, and if today was any indication, they’re finally falling into the pool of talent that has been teased all these years. Washington looks young and unpolished, but they have the makings of a great team. Perhaps most promising is that their rookies and transfers came out in force today. Stephanie Phillips played as well as advertised, 2018 D-III Player of the Year Runner-Up Haley Lescinsky was fantastic, and the rest of the roster also impressed. Element had moments of weakness, and they clearly need to clean up their offense a little, but it was very promising for a team that has had its fair share of struggles in the past. They weren’t really tested today — UCSC gave them their closest game at 10-8 — but could win some points tomorrow on sheer talent alone. Even if they can’t quite put it together in bracket play, there’s a lot to look forward to with this young roster. 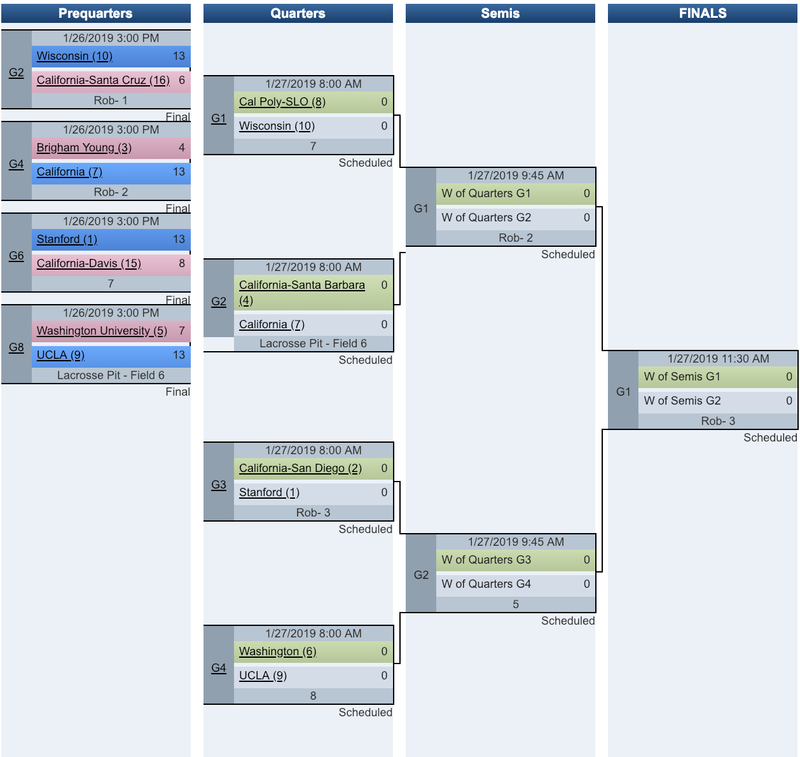 Comments on "Santa Barbara Invite 2019: Four Saturday Stories & Sunday Bracket (Women’s)"